Bands don’t always have to be from America to sell millions of copies. While it certainly helps to have a following in the states, there have been a number of really popular bands who have come from smaller countries. Today’s featured group hails from a country all of 175,000 square miles and 9 million people. That hasn’t stopped them from selling 15 million records worldwide. A couple of Swedish heavy metal musicians decided to start a band back in October of 1992. While living in Jonkoping, Sweden, the duo found three more musicians to complete the band and decided to live in the same apartment. It was a small, one-bedroom place, but they credit the tight space for helping them form an initial bond instead of just going separate ways. They recorded a demo tape which led them to get picked up by a Swedish label in 1994. With the album release only coming in Sweden and Japan, the band didn’t pick up too much steam (although it did contain a track called “Rise & Shine” which when re-released in 1997, would go on to become a big hit in their native country). Regardless of the slow start, The Cardigans were on their way, just waiting for the one big break. 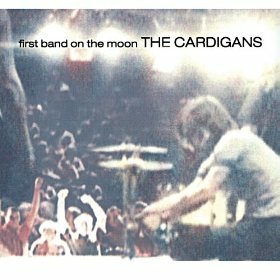 Their third studio effort, First Band On The Moon came out in September of 1996. Having become a fairly solid-selling band in Japan since the early ‘90s, the label Mercury Records decided to take a chance on them breaking into the U.S. market. It was a great decision, as lead single “Lovefool” would become an instant smash in the U.S. and Japan. The record would go platinum in Japan within three weeks and gold in the U.S. within a month. It would be featured in various television shows and films as well, with the biggest attraction being “Romeo + Juliet” starring Leonardo DiCaprio and Claire Danes. Piggybacking again on the Japanese popularity, the band provided the entire soundtrack for the popular video game Gran Turismo for their native release. I’m fairly certain that I’ve never listened to this before this morning, other than the lead single. I have to say, I’m incredibly surprised and sad I didn’t pick this up sooner. Lead singer Nina Persson’s vocal is a siren song that keeps pulling you in track to track. It’s got that signature mid ‘90s alt-rock guitar vibe, but paired with her unique higher-end vocal range, it’s a true breath of fresh air for the time. It could almost be considered a pop album, if it wasn’t for this underlying almost punk feel to it and some of the melancholy lyrics. “Lovefool” is a paramount example, where this super upbeat and popular track is about lamenting a lost love that never loved back. Fair to say I was a 50/50 on even doing this album today, as I felt it was a bit too one-hit-wonder-ish for the blog. But boy am I glad I picked it up, I’m going to head out and spend my hard earned $5 bucks on it, you should too.